As New Delhi becomes pickier, Russia is facing an uphill battle to maintain its leadership position as a supplier to the Indian Air Force. Last week, The Telegraph, Calcutta reported that the Indian Air Force bought its first Boeing-made C-17 Globemaster III military transport aircraft. “We have looked forward to this day. The C-17 will equip the Indian Air Force (IAF) with the world’s most advanced humanitarian and strategic capabilities,” the assistant chief of IAF air staff operations was quoted as saying in an official Boeing press release. 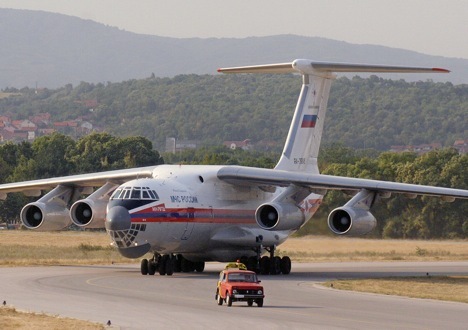 The Boeing aircraft is expected to gradually replace the IAF’s fleet of Russian-made IL-76 planes. Four more C-17s will be delivered to India this year, and five in 2014. The C-17 is used by the United States to haul heavy cargo to Iraq, Afghanistan, and other countries. The Asia-Pacific region is the biggest market for Russian arms, accounting for 43 percent of all deliveries in 2012. “The Near and Middle East accounted for 23 percent, Latin America for 18 percent, CIS countries for 12 percent, and Sub-Saharan Africa for 1 percent,” Rosoboronexport chief Anatoliy Isaikin said earlier. India and Vietnam have traditionally been large importers of Russian arms, followed by China and Venezuela. According to Isaikin, Russia is seeking to expand military and technical cooperation with Indonesia, Malaysia and Brazil. But Russia has lost a number of military contracts in India over the past two years. For example, the MiG-35 lost a tender to the French fighter Dassault Rafale. France managed to one-up the Russian manufacturer thanks to its offset programme, where a portion of proceeds from the contract is invested in the economy of the importing country. The value of the contract grew to $17 billion in the process (the original 126 Russian-made aircraft would have cost $10 billion). The Mi-28NE Night Hunter combat helicopter lost to the AH-64D Apache (a $1.4 billion contract); the heavy cargo helicopter Mi-26T2 lost to the American CH-47F Chinook (a $1 billion contract); the Ilyushin-78MKI-90 aerial refuelling tanker failed to win a tender from the Airbus-made A330MRTT (a contract valued at around $1 billion). Experts believe that the reasons for Russia’s setbacks in Indian tenders are both political and technical. “The general background of constant delays and prices of certain projects spiralling out of control has damaged Russia’s image and can be used as an argument by opponents of military and technical cooperation with Russia,” said Ruslan Aliev, editor of the trade web portal Periscope.2 of the Centre for Analysis of Strategies and Technologies (CAST). Selecting arms suppliers also involves the pragmatic principle of “not putting all your eggs in one basket,” Andrei Fomin, editor-in-chief of the trade journal Vzlyot, explained earlier. “This is totally understandable and by no means a disaster, particularly given the scope of cooperation between Russia and India on a number of different programmes,” he said. India also has its own global strategic priorities, Aliev added. The Indians are concerned with China’s rising economic and military might, and a slew of large defence orders from the United States are linked to their desire to strengthen military and political partnership with Washington, he added.